Avocado prices have spiked in reaction to President Trump’s repeated threats to shut down the border between the U.S. and Mexico, a report said Tuesday. The price of Hass avocados from the Michoacan region of Mexico jumped 34 percent on Tuesday — notching the largest one-day gain since 2009, Bloomberg reported. If the U.S.-Mexico border did shutter, prices of the pear-shaped fruit could climb even higher, according to the report. “Avocado prices could easily double or triple if we shut down the border,” Roland Fumasi, the vice president of Rabobank, which tracks agricultural financing, told Bloomberg. Fumasi told the outlet that avocado prices likely spiked because importers increased purchases before any border issues. 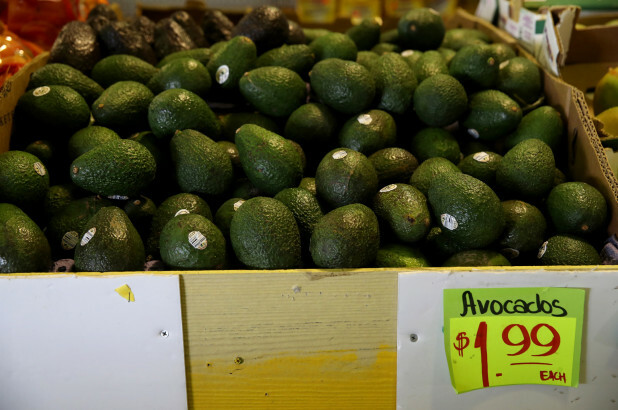 He added that a heat wave in California also limited the avocado harvest in the state, making the U.S. mostly dependent on Mexico for the crop. “Because California is late and it’s a small crop, Mexico is accounting for nearly all of our avocados,” he told the news outlet. Trump, speaking from the oval office on Tuesday morning, acknowledged that shutting the U.S. border with Mexico could have negative effects on trade.